Vascular Graft Market size was valued at USD 2.4 billion in 2017 and is expected to witness 6.3% CAGR from 2018 to 2024. Rising pervasiveness of cardiovascular diseases and aortic aneurysms coupled with chronic kidney disease will boost market growth during the foreseeable future. Rising incidence of cardiac disorders is attributable to adoption of sedentary lifestyle along with unhealthy diet and alcohol abuse. High number of cardiovascular diseases will spur market growth in the upcoming years. Moreover, growing burden of chronic kidney disease will lead to high number of haemodialysis procedure. Haemodialysis requires employment of vascular access for completion of dialysis procedure, thereby increasing demand for vascular grafts. Increasing prevalence of end-stage renal disease will impel vascular graft industry growth during the projected timeframe. Increasing geriatric population pool coupled with rising number of chronic limbic ischemia cases will potentially spur the market growth. According to United Nations (UN) statistics, in 2017, there were an estimated 962 million people aged above 60 years across the globe, accounting for about 13% of the total world population. The major factors for such demographic shifts are increasing life expectancy and decline in fertility rate. 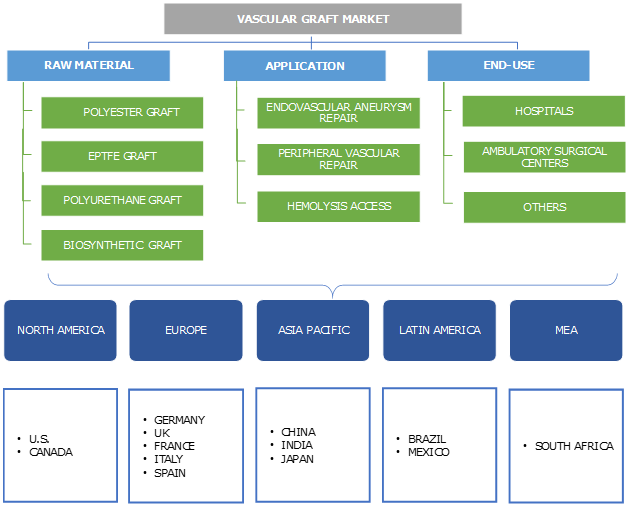 Such factors will lead to increasing demand for vascular grafts in healthcare facilities, thus propelling vascular graft market growth. Growing need for development of innovative and advanced vascular grafts for cerebrovascular treatments will positively impact vascular graft business growth. For instance, Medtronic developed Endurant II Stent Graft System for treatment of abdominal aortic aneurysms. This product offers accurate placement and controlled deployment for flexible and kink-resistant delivery of the graft. In addition, development of cell free and tissue-engineered vascular grafts will minimize complications associated with conventional grafts. Such advancements will foster vascular graft industry growth in the foreseeable future. However, low reimbursement rate and high cost of cardiovascular surgeries in developing economies can hinder the market growth. Complications associated with vascular grafts such as graft rejection and infection will restrict market growth in the upcoming years. Polyester graft segment dominated in 2017, with segmental revenue of USD 1,457.3 million. Polyester graft has wide array of indications such as abdominal and thoracic aortic aneurysms, peripheral artery disorder, and haemodialysis access. Recent advancements in polyester graft have enabled its rapid adoption; for instance, combination of polyester grafts with collagen for development of biosynthetic grafts. This provides better tensile strength and reduces chances of graft rejection. Moreover, high demand of polyester grafts, due to its associated advantages such as longer lifespan and blood compatibility will augment segmental growth. Expanded polytetrafluoroethylene (EPTFE) graft segment will grow at a momentous rate of 6.3% during the forecast timeframe. Fast growth rate is attributable to its huge applicability and associated biocompatibility. EPTFE graft is broadly used in haemodialysis access, peripheral vascular surgery and extra-anatomical procedures. 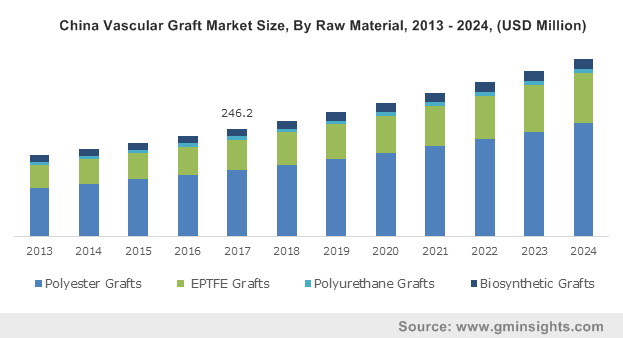 Technological advancements in the conventional EPTFE graft will lead to its escalated demand in the future. For instance, end-point covalent attachment of EPTFE with heparin provides high thrombogenic resistance and reduced platelet attachment. Such advancements will favour segmental growth in upcoming years. Endovascular aneurysm repair accounted for largest market share of USD 996.5 million in 2017 and is estimated to show similar trend during the projected timeframe. This is due to increasing demand for minimally invasive surgical procedures. Endovascular aneurysm repair offers cost-effective treatment to patients suffering from abdominal aortic aneurysm compared to open repair. Also, complications associated with open repair procedures will lead to higher adoption of endovascular aortic repair. High healthcare expenditure and reimbursement scenarios in developed economies will propel market growth in the foreseeable future. Peripheral vascular repair segment is estimated to grow at 6.0% across the forecast timeframe owing to high prevalence of peripheral artery disease. Various lifestyle diseases such as high blood pressure, diabetes, obesity lead to development of peripheral artery disease. One of the major factors leading to peripheral artery disease is atherosclerosis. According to World Health Organization (WHO) statistics, more than 15% of the population globally die due to atherosclerosis. Large population base affected by atherosclerosis and peripheral artery disease will lead to adoption of peripheral repair, thereby favoring segment growth. Hospitals segment held largest revenue of USD 1,535.7 million in 2017. The segmental growth is credited to rising number of minimally invasive surgical procedures in hospitals and favourable reimbursement scenario for vascular grafts in developed countries. Moreover, various government regulations to implement high quality patient care will attract large patient pool in hospitals to seek treatments. Increasing healthcare investments and growing disease burden will support segmental growth in forthcoming period. Ambulatory surgical centres segment will grow with a remarkable rate of 6.6% during the forecast timeframe. The segmental growth is attributable to rising demand for short hospital stays and cost-effective treatments for various cardiovascular disorders. Ability of ambulatory surgical centres to offer single day cardiovascular surgery and lower healthcare-associated costs will favour ambulatory surgical centre segmental growth in the upcoming period. U.S. dominated North America vascular graft market with revenue of USD 742.0 million in 2017. There is increasing geriatric population base and numerous cases of cardiovascular and chronic kidney disease throughout U.S. According to John Hopkins Medicine statistics, U.S. spends about USD 315 billion annually for cardiovascular disease management. High healthcare expenditure will result into substantial market growth. Moreover, various reimbursement policies by Medicare and Medicaid will foster regional growth in foreseeable years. Indian vascular graft market is forecasted to grow at a rapid rate of 7.6%, owing to rising number of cardiovascular surgeries due to escalating incidence rate of chronic diseases. Additionally, increasing incidence of end-stage renal disease will lead to higher number of hemodialysis procedures performed, thereby increasing demand for vascular access. Improvement in healthcare policies and growing awareness among Indian population will drive industry growth in India during the projected timeframe. Few of the notable industry players operating in global vascular graft market are Becton Dickinson (C.R. Bard), B. Braun, Cryolife (Jotec), Cook Medical, Endologix, Getinge AB, LeMaitre Vascular, Medtronic PLC, Terumo GmbH and W.L. Gore and Associates. These companies are opting mergers and acquisitions, novel product launch to sustain business in vascular graft industry. For instance, in October 2017, Medtronic announced that it received U.S. FDA approval of Endurant II/IIs stent graft system for treatment of abdominal aortic aneurysms. This approval will enable the company to strengthen its market presence and expand its product portfolio. Employment of synthetic vascular grafts for cardiovascular surgeries dates back to the late 1950s and have progressed from basic vascular grafts to sophisticated stents. Dacron and EPTFE are the most widely used materials for large diameter vascular grafts. With introduction of significant technological advancements, several improvements have been sought by researchers and medical device companies. Already new research studies are being conducted to prepare cell free and tissue-engineered vascular grafts. Vascular graft industry is expected to grow rapidly in the future and witness high success due to increasing life expectancy of people, growing burden of chronic diseases and innovative product launches. These factors will offer wide range of scope and opportunities for the rapid growth of industry.